Sami Whitcomb looks to pass to Sue Bird. 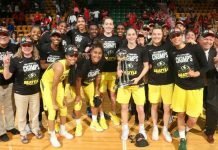 Photo courtesy of Seattle Storm. 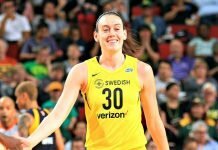 Seattle – Neither the New York Liberty or Seattle Storm set a season-high for free-throw attempts on Thursday night. It merely felt that way. The two teams combined to take 52 shots from the charity stripe in a match up punctuated by consistent whistles, as New York snapped a three-game losing streak with a 79-70 win over Seattle. 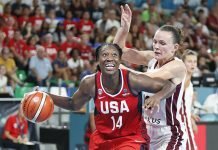 Tina Charles had a game-high 29 points, Epiphanny Prince had 16, and Kia Vaughn finished with a season-high 13 for New York, while Breanna Stewart recorded her sixth double-double of the year with 20 points and 14 rebounds to lead the Storm, as one of five Seattle players in double-figures. The win was New York’s first in three tries during the team’s four-city, 12-day road swing, after losses to Washington and Atlanta dropped the team to .500. Liberty coach Bill Laimbeer liked how his team fought through travel fatigue by stepping up defensive play. Charles said the victory was important for the team. The Liberty looked the part of a road weary team for much of the first-half, as the Storm started the night on a 7-2 run, and led by as many as nine in the first quarter, paced by Stewart’s six points and six rebounds in the first 10 minutes. Seattle held a 35-28 advantage with just over three minutes to play in the half, before a 10-0 Liberty run helped propel New York to a one-point lead at the break. Both teams traded baskets for much of the third, with New York holding a two-point edge with just under four to play, before another 8-2 Liberty run put the team up eight heading into the fourth. New York stretched that 8-2 run into a 14-2 run in the first 90 seconds of the final period, before Seattle came up with one final run to make it a two possession game with less than six minutes to play after back-to-back threes from Stewart and Sami Whitcomb. But six was as close as Seattle would get. Coach Jenny Boucek said her team’s stagnant offense and all the fouls called impacted the flow of the game. Seattle is back at KeyArena on Saturday for a 6 p.m. match up with Los Angeles, while the Liberty finish their road swing in Phoenix on Sunday, also at 6 p.m.
New York takes the season series 2-1. 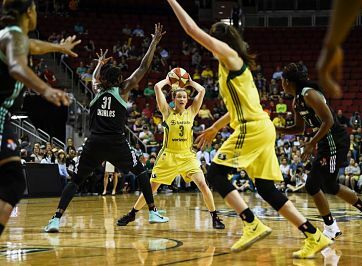 Seattle won the first matchup at KeyArena 87-81 on May 26, while the Liberty evened the series with a 94-86 victory in New York on June 11. Guard Nayo Raincock-Ekunwe had a vocal cheering section behind the Liberty bench on Thursday. She went undrafted in 2013 out of nearby Simon Fraser University in Vancouver, and spent time in Switzerland, Germany, and Australia before being signed by New York this offseason. Lanay Montgomery and Alexis Peterson were healthy DNPs for Seattle.